The processes of eucalypt recruitment are infrequent, patchy and difficult to predict. Long timeframes with appropriate incentives are needed to manage natural regeneration. 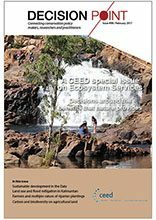 These are the conclusions of Peter Vesk and colleagues who sought to investigate the processes of eucalypt regeneration within the Bush Returns trial, a native vegetation management incentive scheme in the Goulburn Broken Catchment of Victoria. By year 4 of the 10-year program, eucalypt seedlings were found at about 24% of sampled quadrats. This varied substantially across sites, with only half the participating properties having any seedlings. Individual trees varied widely in their seed production, but seed rain was not related to the spatial context of the trees. Seedling emergence was infrequent and seed sowing trials had very patchy, and overall low, success. Seed removal experiments indicated that seeds were removed faster and more completely in sites with more bare ground (less grass and litter) and during warmer weather. What do dairy farmers think? Are people willing to pay for carbon farming?